The month of August is literally flying by (hello, August 19!). The husband and I have had every weekend booked with activities/trips that we pretty much are looking at fall now. School has started again today in San Francisco so people have returned to the roads earlier in the morning, fall previews for television shows are making me excited to watch them again and I'm looking at replacing my summer pieces with fall pieces. With so much looking ahead I almost forget to "live in the moment." This weekend I had to re-learn how to appreciate the people and the moments around me. Sometimes I get overwhelmed with things that "may happen" or "will happen" that I forget things are happening now. I wore this outfit to our local farmer's market and one of the vendors gave me a flower as I walked away. It was the simplest of gestures but it put a smile of my face for the rest of the day. I appreciate that moment. I love love love this outfit! I like how you added bright colors to the ensemble through your lips and your shoes. Not even a pop, it's more like a shock of color! Absolutely beautiful! Oh I hear you, I did just that this weekend and headed to Fire Island with friends it was just what I needed! 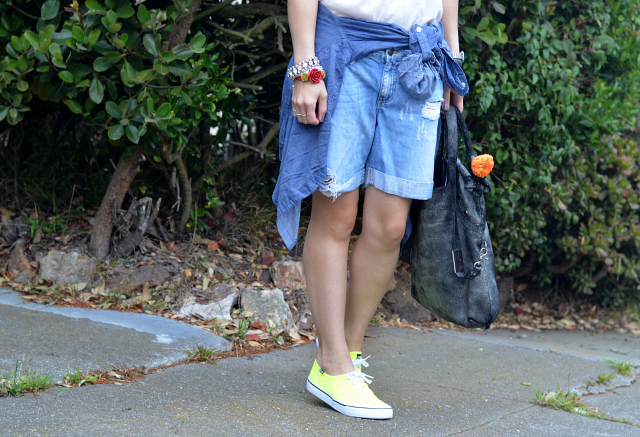 LOVE the pop of color in your Keds! That was a very nice gesture! I love the embellishments on your tshirt. So pretty. I'm looking forward to Fall too. Nice! I like the bright shoes! And it's soo crazy how fast the summer has gone by! Love the shorts! 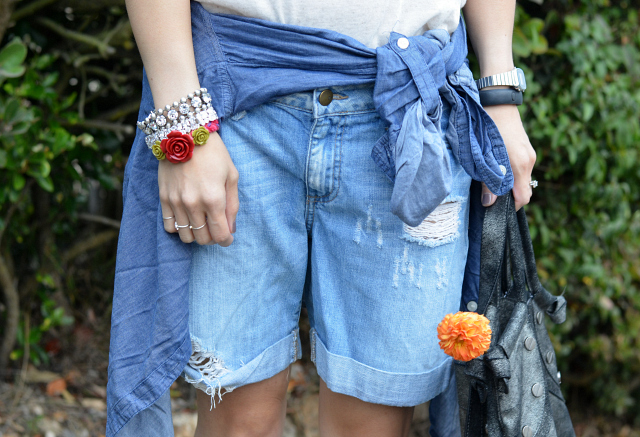 Your accessories are killer! Nice look and love the combo!! What a sweet gesture from the farmer. 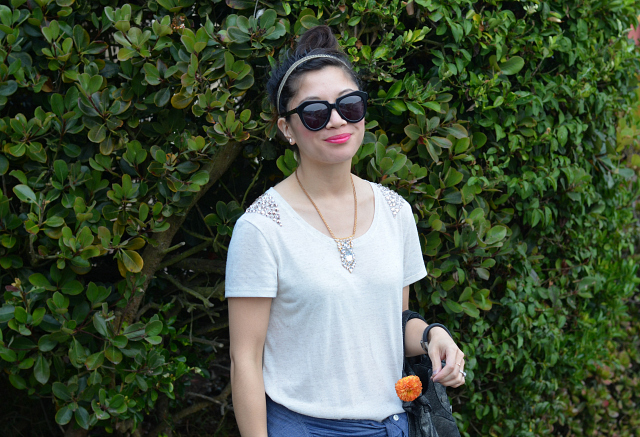 Love this causal look and the jewel details on your tee! comfy and stylish! love the accessories! I really like how the addition of the lipstick adds a fraction of glam to the casual look. 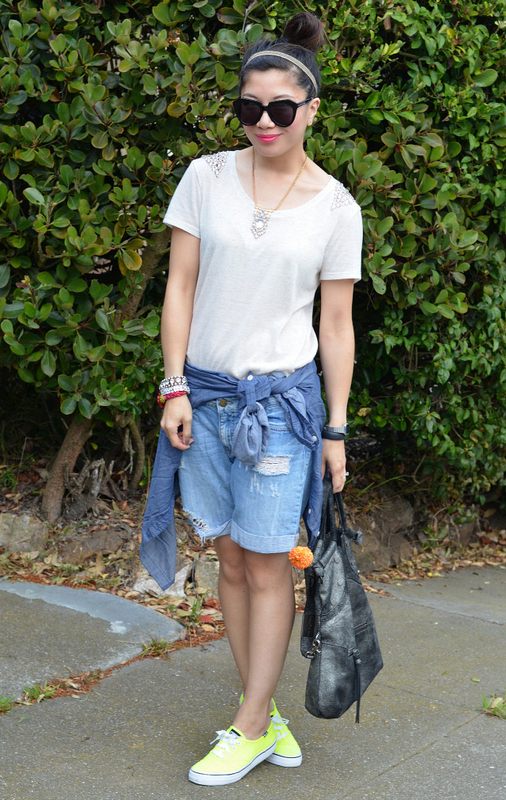 Very cute and comfy look! Love the color of your shoes, and those shorts are awesome! 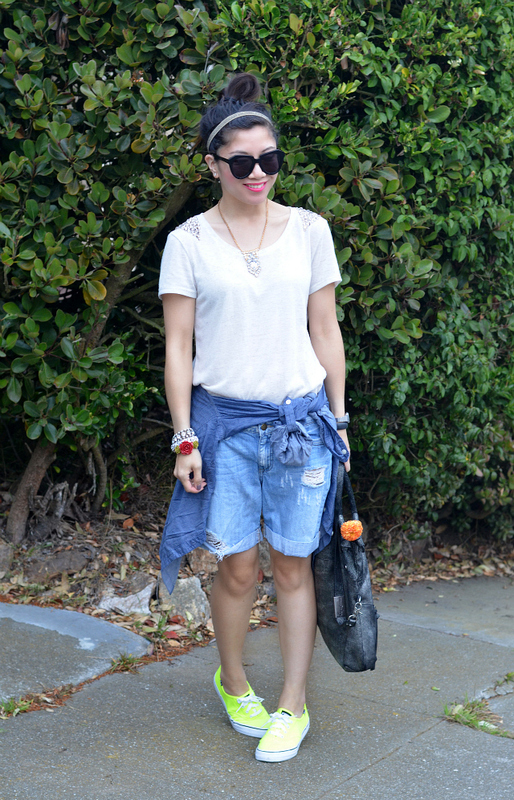 Love this simple casual look on you!